It’s being almost a year I wrote about a dual-SIM Android mobile phone. Because there’s really nothing to write about. Now I have one from Alcatel. They already made a good number of entry level affordable Android phones, now they have one dual-SIM, dual-standby device- Alcatel Blaze Duo OT-918. It’s a cheap Android phone running Android 2.3 Gingerbread with a 650MHz processor + 256MB RAM. The screen is a 3.2" LCD with HVGA resolution, and there's also a 3MP camera, A-GPS, Wi-Fi b/g/n, Bluetooth 3.0 and A-GPS to complete the pack. The Alcatel Blaze Duo phones pack two SIM cards in an interesting way. Both SIMs go in the same slot, just the first one goes face down and the second one goes face up. You can use 2 normal size SIM in this slot. 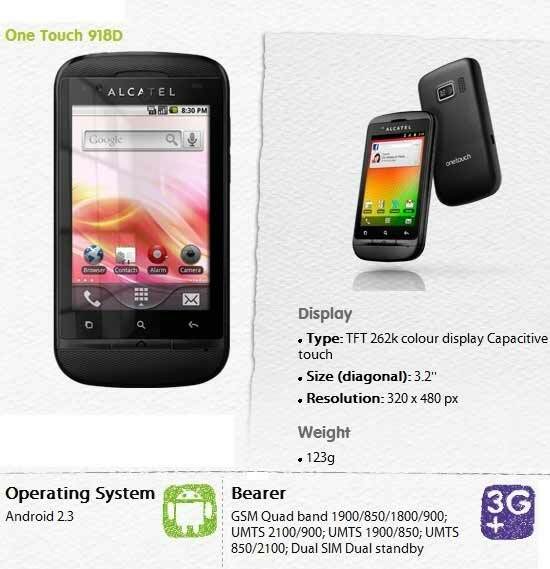 There are two different variants of Alcatel Blaze Duo. The OT-918N uses 850MHz/2100MHz for its 3G connectivity, while the OT-918D version uses 900MHz/2100MHz instead. It totally depends on your region. So you have nothing to worry about. The Blaze Duo OT-918N is available right now in the Philippines 6000 Philippine pesos (about $140/€105). The 918D is available in Australia for $179. There's no complete information on availability elsewhere. Keep in mind that there's a single-SIM version of the phone called just OT-918, so don’t be confused.